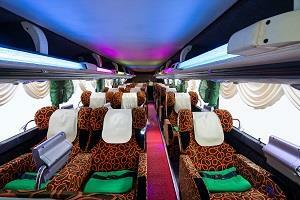 Grassland Express is one of the largest and most popular bus operators based in Singapore. Grassland Express was the first mover and game changing operartor in the bus industry to be the first bus operator to launch Super VIP 27 seater bus. They immediately captured the market share and became the market leader in bus industry, especially the long distance journey trip like Singapore to Ipoh and Singapore to Penang, as well as the returned trip. 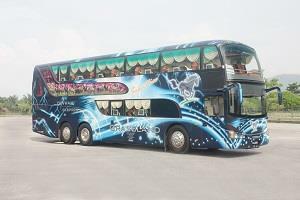 Grassland provides comprehensive bus service departing from Singapore to various destinations in Malaysia. Grassland Express provides the most daily departures from Singapore to Kuala Lumpur, and returned trip from Kuala Lumpur to Singapore. Apart from that, Grassland Express provides morning and night daily departures, could be multiple morning trips daily or multple night trips daily, from Singapore to Ipoh, Penang, Alor Setar, Sungai Petani and many other smaller towns in Perak (like Bidor, Tapah, Gopeng, Kampar, Teluk Intan, Lumut etc). Grassland Express buses are famous with its spacious seat with plenty of leg space, thick seat cushion. This spacious seat is especially important to passengers going for long distance journey to Northern Malaysia like Ipoh, Penang, Sungai Petani and Alor Setar. To Northern Malaysian passengers, the spacious and comfortable seat is the unique selling point. Besides that, Grassland all rounded service is one of the highlight. In Singapore, the departure location and check in location is conveniently located at Golden Mile complext, which is just 5 minutes walking distance from Nicoll Highway station (Circle/Yellow Line). As for Kuala Lumpur departure point, it is strategically located opposite Berjaya Times Square (Bukit Bintang), within the heart of Kuala Lumpur. This city centre pick up and arrival point is especially convenient for tourists who are not familiar with new bus terminal, Terminal Bersepadu Selatan, at the outskirt of city. Starting from March 2017, Grassland Express expect to complete the installation for WiFi and USB charging port on all their coaches. These are the additional facilities offered by Grassland Express for their passengers. Apart from listening to music and watching movies, passengers can also charge their phone during the journey and not worry about phone’s dying battery.